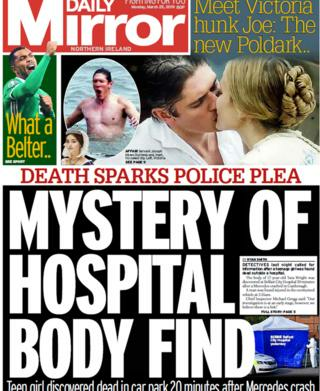 The death of a teenage girl, whose body was found near Belfast City Hospital, makes most of Monday's front pages. The 17-year-old was found next to a grey car in the hospital grounds on the Lisburn Road shortly before 03:00 GMT. Police believe the death was linked to a crash on the outskirts of the city on Sunday. The Daily Mirror reports that a silver Mercedes was found on its roof in undergrowth in Castlereagh and a man was taken to hospital. Police said a post mortem examination will be carried out. The News Letter splashes with the the news of a County Fermanagh cash machine which was torn from the wall of a filling station. The built-in ATM machine was removed by a digger from the filling station's wall in Irvinestown on Sunday. Police suspect the digger was stolen from a nearby building development. The thieves are understood to have loaded the cash machine on to a trailer before setting the digger alight and fleeing. The News Letter reports that Northern Ireland proposed licensing law changes ahead of the Open golf championship in Portrush have been described as "a sham." The Department for Communities has launched a consultation on the proposed changes to licensing laws, which it believes would benefit the hospitality and tourism sectors in Northern Ireland, the News Letter reports. Ulster Unionist MLA Robbie Bulter told the newspaper that it's a "sham" that it took until the Open to reform the "outdated and obsolete" liquor licensing laws. Inside the Belfast Telegraph, singer Niamh Kavanagh makes the headlines after she revealed that she was told that her husband, musician Paul Megahey, had suffered a stroke at home while she was in the middle of a concert. She was performing with fellow Eurovision Song Contest winners Paul Harrington, Charlie McGettigan and Linda Martin at the Opera House in Cork last October when she got a text from her son asking if she could call him. She told RTE's radio programme, Sunday with Miriam: "I still had to go out and sing Waterloo and Making Your Mind Up after that... that's the nature of what I do, you don't always get to choose what you do in that moment." The Irish News details the unveiling of a new Blue Plaque dedicated to a Belfast-born engineer who designed the controversial Los Angeles Aqueduct. William Mulholland, who was baptised in 1855 on Donegall Street, is still remembered in the City of Angels with the names of Mulholland Drive, Mulholland Dam in the Hollywood Hills, Mulholland Highway and Mulholland Middle School. The Ulster History Circle will dedicate the plaque to Mr Mulholland at St Patrick's Church on Monday.